The Association has three qualifying levels: Student Member; Associated Member and Full Member. The majority of artists are typically admitted as student members. Students are provided with a grant to pay for tuition, art materials, etc. To maintain consistently high standards, students' work is periodically reviewed by a panel of assessors until they achieve a standard which enables them to be accepted as full members. The Association is constantly seeking promising new talent among the disabled who, perhaps, first take up painting as a form of therapy. New Zealand artists foster links with education and training establishments for disabled people. This arrangement removes a great fear from the disabled artist - the possibility of losing one's ability to paint through deteriorating health. Members also benefit from interaction with each other. Members and students have the opportunity to meet at the Association's conferences, exhibitions and other events, where they are able to gather, interact and learn from each other. ACC Active Smart is a new website service which essentially offers a free online customisable training schedule for walking, running, cycling or multi-sport. While the plans are geared towards those without disabilities, in combination with your health professional you can create a realistic schedule outlining your goals then track your progress. The Green Prescription initiative is a health professional's written advice to a patient or their family to encourage and support them becoming more physically active as part of a total health plan. The scheme encourages general practitioners to target several medical conditions associated with inactivity, and has been used by over 80% of New Zealand General Practitioners. The initiative consists of two components: Green Prescription (for adults) and the Green Prescription Active Families programme which aims to increase physical activity for children, young people and their families, and was introduced in 2004. This initiative is very cost-effective and offers very cheap rates at certain exercise facilities, including gym visits for as little as $1 per visit. Instructors will work with your abilities and limitations and help create a programme that will work for you. For contact details please use the form titled "Green Prescription contacts" also at the bottom of this page. Sponsored by Panacea Healthcare, this website is unique. It is both an information tool to help plan your holiday within New Zealand, as well as offering the professional services of carers, support workers and nurses to join you on your trip (for a price of course). General Information about Travelling in New Zealand - information on the climate, timezones, driving in New Zealand, language, population, shopping, nightlife, public holidays, money matters, services and utilities etc. Disabled World - disability news space with health and medical information for seniors, baby boomers and people with disabilities including a blog and disabled products. You can also book accommodation and rental vehicles, or plot your itinerary using one of their many search functions. 1. Call ahead. Service providers are required by law in many cases to accommodate travellers with special needs. However, most need some time to make the necessary arrangements. Mention your needs at the time of reservation, and call the provider 24 to 48 hours before your arrival to confirm that proper accommodations have been made. 2. Be specific and clear when describing a disability. Not all service providers know the "lingo" of accessible travel, or the medical terms for certain conditions. Give as many details as you can about what you can and can't do, and don't downplay the severity of the disability. The more information a service provider has, the better they will be able to accommodate you. 3. Be specific and clear when describing the trip to your doctor. A doctor can often prescribe measures for coping with an unusually long flight, limited medical facilities at your destination, the unavailability of prescription drugs and other pitfalls of travelling Be prepared -- in some cases, your doctor may question the advisability of travel. For more information, see Medications for Travel. 4. Take a doctor's note and phone number. Travel with a statement from your doctor, preferably on letterhead, covering your condition, medications, potential complications, special needs and other pertinent information. Be sure you have a number where your doctor (or another medical professional) can be reached in an emergency situation at any hour of the day. 6. Investigate physician availability where you will be travelling Your doctor, health care provider, insurance company or local embassy can provide the names and contact numbers of physicians at your destination. For more information, see Health Care Abroad. 8. Consider using a specialist travel agent. Some agents provide stellar niche services; one might be very experienced in working with hearing-impaired travellers another with developmentally impaired travellers. Since the requirements for these varied travellers can be staggeringly different, it helps to find someone who knows the ropes. 9. Avoid connecting flights. Although wheelchairs are the last items to be checked into the luggage compartments, and thus first to be pulled off, flying direct can save you unnecessary time and hassle. One exception: If you have trouble manoeuvring into airplane lavatories, long flights may become uncomfortable -- so a series of shorter flights might be a better option. If you do choose to connect, be sure to allow plenty of time between flights (we'd recommend at least 90 minutes) to get from one gate to the next. 10. Allow plenty of time before your flight to check in, get through security and transfer to your gate. Arrive at least two hours before a domestic flight and three hours before an international flight -- more if you're travelling at a peak time. 12. Don't forget about transportation to and from the airport. If you have a wheelchair, make arrangements in advance to have an accessible vehicle pick you up in your destination city. 13. Bring spare parts and tools. Wheelchairs can take tremendous abuse while travelling; assemble a small kit of spare parts and tools for emergency repairs. You may also be required to dismantle a wheelchair for certain flights or activities; make sure you and your travelling companions know how to do this. 14. Know your rights. Before going through airport security, be aware of the TSA's rules for travellers with disabilities and medical conditions. The Department of Transportation's Aviation Consumer Protection Division has a comprehensive guide to the rights of disabled air travellers. This is a very inspirational website written by a disabled couple who have continuously travelled the world for the past 25 years. Loaded with photos, advice and stories of adventure. 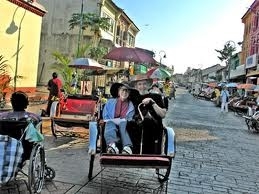 The Disabled World disability travel website covers reviews of accessible tours, vacations, and cruises for persons with disabilities including wheelchair accessible accommodation reviews and articles about interesting places to visit and/or vacation around the world. Our holiday travel destinations are listed by continent, as seen in the right hand menu, and include travel tips for those travelling with disabilities and various health conditions. Many of these travel articles have been written by Disabled World members who wanted to share their travelling experiences with other readers in the hope they will be of assistance to others with disabilities who may be thinking of travelling locally or abroad. Leisure Options is a Licensed Travel Agent, an Accredited Tourism Business and a full member of the Travel Compensation Fund. Since 1994 the company has been Australia's leading and favorite provider of supported holidays for people with disabilities. We specialise in providing local, national and international holidays for people with physical and intellectual disabilities, acquired brain injuries, anyone requiring a travel companion, the frail or elderly or families in need of respite support. Leisure Options offers a positive approach in supported travel. We provide holidays that allow maximum choice, loads of fun, high staffing ratios, a commitment to individual needs and a supportive holiday environment. We cater for all ranges of disabilities from the very independent to those requiring 1:1 support. Leisure Options plans a wide range of holidays for people with different interests, skills and abilities. These categories act as a guide so you can choose a holiday to suit your capability and needs. A participant who requires constant supervision in the community due to inappropriate social skills. 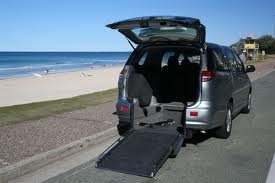 Flashcab Rentals provides a fleet of wheelchair accessible vehicles to rent from our depots at Sydney, Brisbane, Adelaide and Gold Coast, with all vehicles delivered to selected airports, collection points and rail stations. We also service the disabled community and respite centres with long term hires as required. Hires commencing from our hire depots do not have delivery fees and drop fees etc. Airports and rail stations are charged a $100.00 delivery/drop charge. All drivers must be 25 years + with a full licence and a clear driving record. Maximum driver age is 75. Vehicles accommodate most wheelchairs available on the market including electric chairs. Dimensions of the wheelchairs are available on the website.